Our volunteer Stan has been busy as ever scanning the museum’s million+ photographic negatives, and this week has chosen to share a real treat. Below are some highlights from a collection of glass-plate negatives depicting the transport of turbine electricity generators from the works in Heaton, Newcastle of C.A. Parsons & Co. Ltd. The company was founded in 1889 by Sir Charles Parsons, inventor of the steam turbine, and for more than a century produced turbine generators which were exported across the world and even found their way into several of Britain’s nuclear power stations. Parsons & Co survives today as part of the Siemens group. 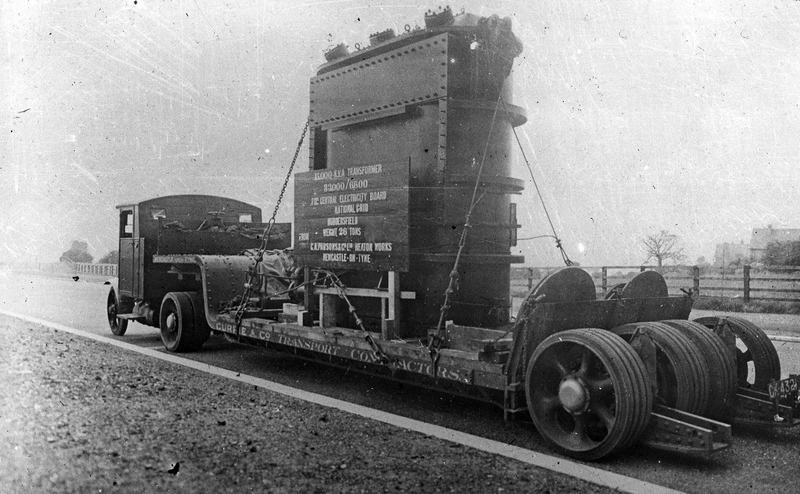 As can be seen from the photographs, transporting the behemoth generators was no easy task! 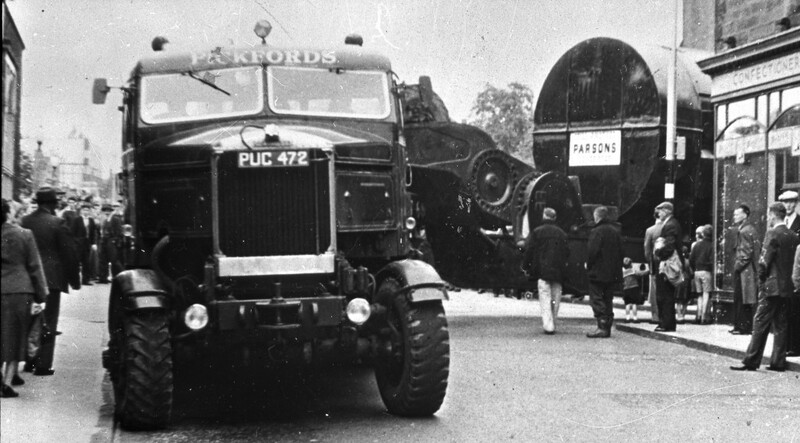 Quite a change of pace from furniture removals – a Pickfords Scammell lorry picks its way through an unknown location in the early 1960s while transporting a generator to Kincardine Power Station in Fife, Scotland. The station opened in 1962. 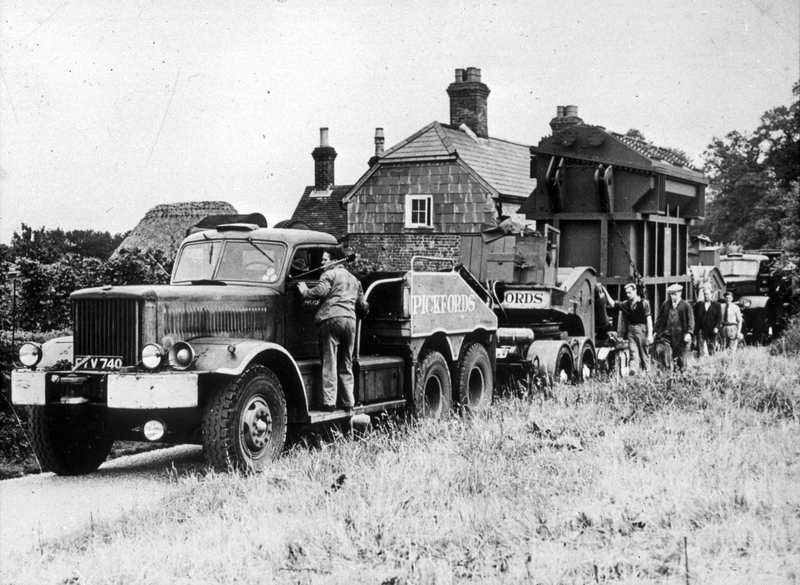 Another undated view, though likely to be pre-WW2 based on the vehicle, owned by Currie (?) and Co, Transport Contractors, Newcastle. Handily, the load tells us exactly what it is and where it is going! This entry was posted in Adventures in Collecting on August 31, 2014 by BeamishMuseum. Front of Donaldson’s business postcard. 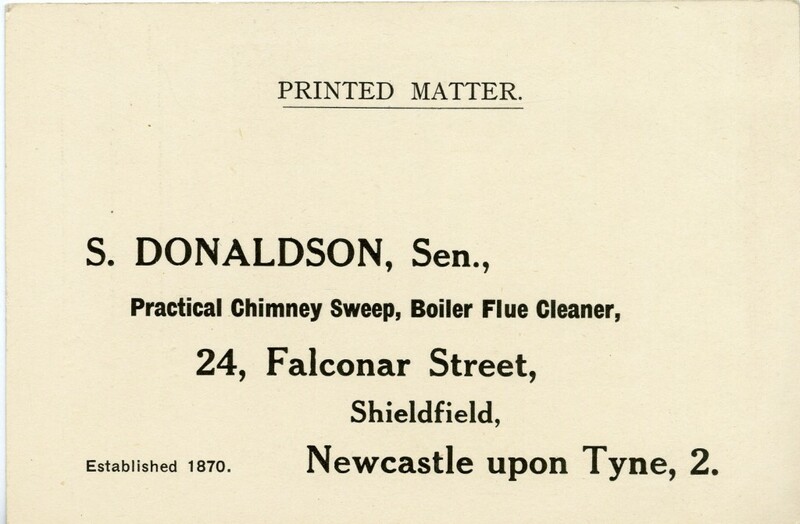 Reverse of Donaldson’s business postcard. 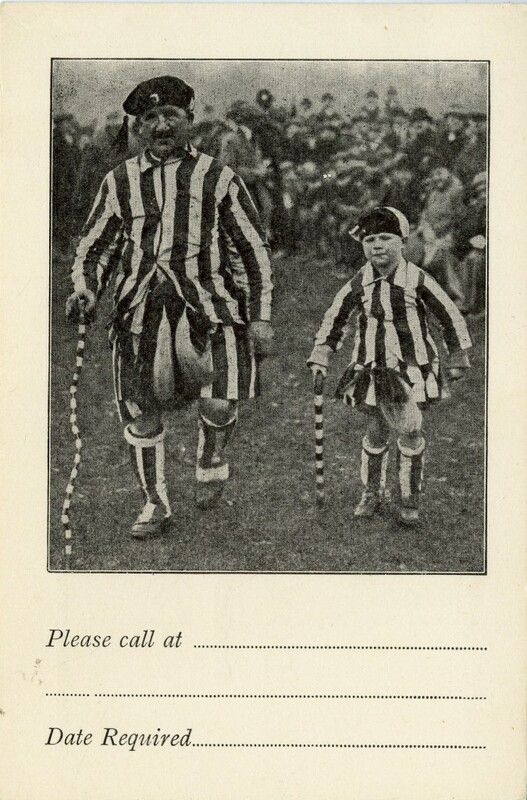 This entry was posted in Adventures in Collecting on August 29, 2014 by BeamishMuseum. Our scanning volunteer, Stan, has this week chosen to share with us a much more colourful item from the museum’s archive than the usual black-and-white photographs. It is a postcard advertisement for a production of C. W. Mill’s ‘A Wrecker of Men’ at the Theatre Royal, West Stanley, likely around the time of the First World War. Charles Watson Mill (died 1933) was a noted playwright and theatre owner whose other works included ‘The Eve of Her Wedding’, ‘The Sinner’ and ‘A Warning to Women’. A copy of the manuscript for ‘A Wrecker of Men’ is held in the National Archives in London, and if anyone can enlighten us as to what it is in the play that wrecked men (early guesses among the staff include alcohol, women, restricted substances or more women), then we’d love to hear from you! 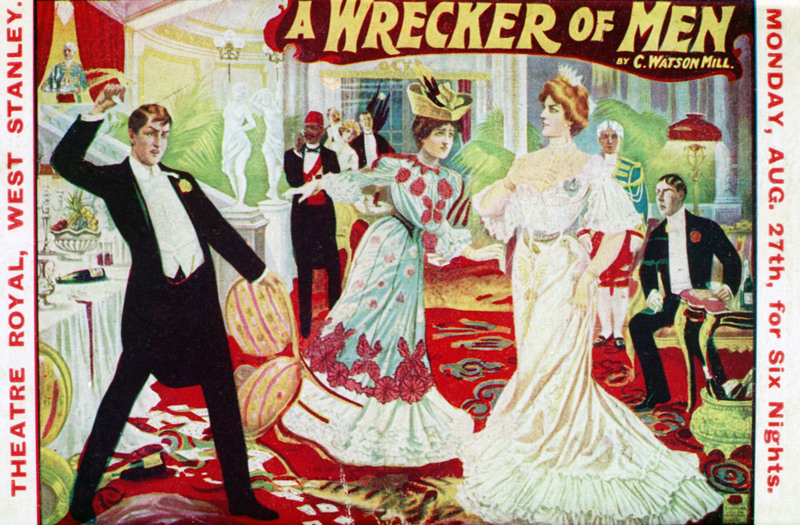 68616 – Postcard advertisement for production of “A Wrecker of Men” by C Watson Hill at the Theatre Royal, West Stanley. This entry was posted in Adventures in Collecting on August 22, 2014 by BeamishMuseum.